Two-goal hero Pascal Gross hailed a special day for Brighton & Hove Albion after they recorded their first-ever Premier League win today. 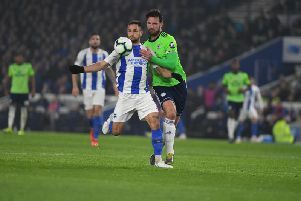 Gross struck either side of half-time and then set up Tomer Hemed for the third in Brighton's 3-1 victory against West Brom. The German midfielder joined the Seagulls from Ingolstadt in the summer and said: "We played a good game and deserved to win. It's the first Premier League win and we're very happy today. "It's a special day for the club and also for me. It was a team performance from us. From the first second, we played a good game and had good possession. "We had a tough programme with the first games but at Watford we knew we could win the game and took a point. We knew we had to improve and had two weeks of training hard during the international break and today we did good."